Dip a chef knife in hot water and dry with a towel before each cut for sharp brownie edges. Wipe the knife clean and repeat. Preheat oven to 350˚. Line bottom and sides of a 13-x 9-inch baking pan with foil, allowing 2-inches to extend over the sides; lightly grease foil. Line bottom and sides of a 13-x 9-inch baking pan with foil, allowing 2-inches to extend over the sides; lightly grease foil. Whisk together the first four ingredients in a small bowl. Set aside. Microwave chocolate and butter in a large glass microwave-safe bowl at HIGH 1 1/2 minutes, stirring every 30 seconds until smooth. Whisk in milk. Stir in eggs and sugar until blended; stir in flour mixture. Pour mixture into prepared pan. Bake for 40 to 45 minutes or until a wooden pick holds a few moist crumbs. Cool completely on a wire rack, about 1 hour. Lift brownies from pan, using foil sides as handles. Remove foil, and cut brownies into rectangles; place on a foil-lined half sheet pan. 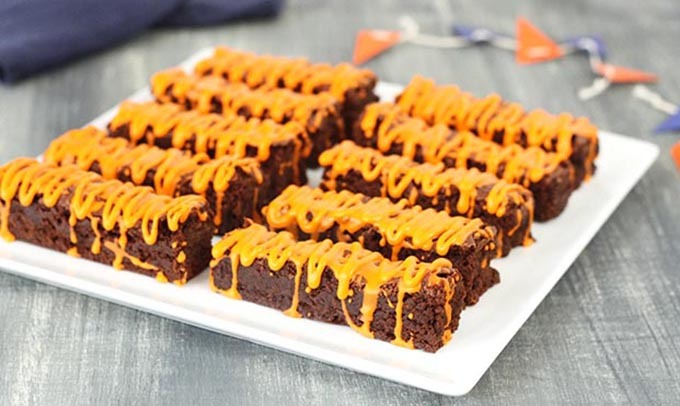 Drizzle Milk Glaze over brownies to resemble tiger stripes. Beat powdered sugar and milk with an electric mixer until smooth. Tint with food coloring paste.